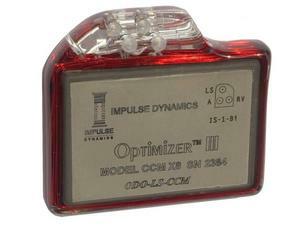 KINGSPORT, TN -- (MARKET WIRE) -- April 2, 2007 -- Cardiovascular Associates has announced today it is studying a medical device in patients to measure the potential health benefits of a new implantable pulse generator called the Optimizer™. The Optimizer delivers electrical impulses to the heart for patients who suffer from moderate-to-severe heart failure. Gregory Jones, MD, principal investigator of the study, said of this research device, "Congestive heart failure (CHF) is a major health problem in the US and world wide. Despite significant improvement in mortality and symptoms from heart failure with pharmacologic treatment, many patients remain incapacitated by their CHF. This therapy is a novel treatment using electrical stimuli delivered to the heart in an effort to improve contractility (forcefulness of the heart beat). This in turn can hopefully improve the functional capacity of the patient and reduce some of their symptoms." How does the Optimizer work differently than other heart devices? There are currently no other devices that provide the same effect as the Optimizer. Pacemakers work to re-establish a normal heart rate through the administration of electrical pacing signals. Defibrillators work to stop abnormal rhythms in a heart that is beating chaotically or too fast by delivering an electric shock. While these devices intend to resolve problems with the heart's rhythm, the Optimizer System is designed to modulate the strength of contraction of the heart muscle rather than its rhythm. What is the unique technology behind the Optimizer? Cardiac Contractility Modulation, or CCM, is a method for treating failing hearts. Unlike signals generated by other cardiac devices, the CCM signals do not initiate a heartbeat. Rather, CCM signals are intended to modify heart cell function in a manner that affects the contractility of the heart muscle. What is Heart Failure & Its Impact? Heart failure is a disease caused by weak or damaged heart muscle that is unable to pump enough blood throughout the body. Heart failure is a disease that afflicts over 5 million Americans and an estimated 15 million patients worldwide. It is one of the most common causes of hospitalization and a growing and costly burden to the healthcare system. It is estimated that the U.S. healthcare system would have spent a projected $29.6 billion on caring for heart failure patients in 2007. Promise and Disclaimer: If proven safe and effective, the Optimizer System has the potential to help treat heart failure in a large number of patients. This is a research device, and results cannot be guaranteed. Since 1978, the continuing mission of Cardiovascular Associates is to provide the highest possible quality of comprehensive cardiac services in a patient-focused, compassionate manner. We are dedicated to the prevention, diagnostic, and treatment of heart disease throughout our communities in the regions of Tennessee, Virginia, Kentucky, and North Carolina. We listen to our patients' heart care needs.